well as some of the materials generated and published within the SIforAGE project. Finally, Section III presents the most outstanding features of the SIforAGE International Conference that will be organised in Barcelona from the 19th to the 21st of October, 2016. The goal is to close the SIforAGE project opening new paths towards the construction of an Active and Healthy future for all the elderly people. Keywords: European Project outcomes, InternationalConference,SIforAGE. Actual data is showing that, besides its individual and medical dimension, Alzheimer has an unquestionable social importance in all Europe. 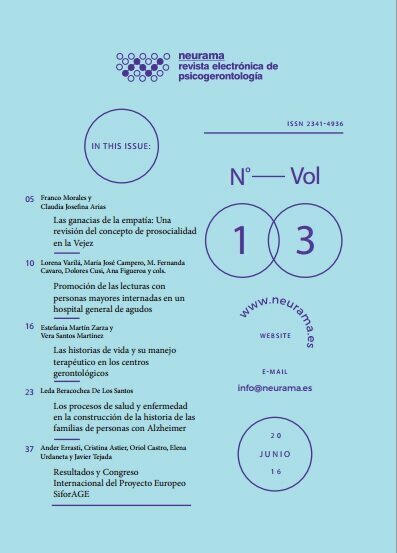 In the following article, Norbert Bilbeny, Full Professor of Ethics at the University of Barcelona (UB), Dean of the School of Philosophy (UB) and Co-founder and former president of the Committee of Research Integrity in the Public Health Institute of Barcelona (IMAS), addresses this key subject from a philosophical perspective. Combining technical expertise with a non-expert format or accessible way of presenting the argument, the author makes a thorough analysis on the need of linking Alzheimer and morality. This is to say, based on the importance of memory for personality; the author states the transcendence of personality in the caring of those who have lost memory. Ethical point of view of ageing. From vulnerability to liberty. Individuals are scared of becoming older and close to death. This fear comes from the association between ageing and vulnerability. However, a new conception about ageing is possible. “Ethical point of view of ageing. From vulnerability to liberty” a working paper by MA Júlia Martín, Professor Joan Guàrdia and Professor Norbert Bilbeny, members of SIforAGE partner GISME, explores this new approach. Based on the results of a survey conducted with old people who regularly attend university, the authors state that old age can be lived differently and defend a global conception of 'person', which implies a new conception of 'vulnerability'. Montse Celdrán, Professor of Psychology and Researcher at the Gerontologist Research Group (University of Barcelona), presents the findings of one of latest papers from her research group. In this study, Professor Celdrán explores the concept of "generativity" related to grandmothers. Generativity refers to the need that adult and old people have to guide and nurture the future generation. Based on a set of interviews conducted with grandmothers who regularly take care of their grandchildren, generativity appears to be present when grandmothers feel that this activity is rewarding, and conceived as a main responsibility and a crucial opportunity to transmit values to their grandchildren. Villar, F., Triadó, C., & Celdrán, M. (2012). Grandmothers offering regular auxiliary care for their grandchildren: An expression of generativity in later life? Journal of Women & Aging, 24(4), 292-312. How to measure the concept of cognitive reserve? A recent paper published in Archives of Clinical Neuropsychology explores this issue. Lojo-Seoane, C., Facal, D., Guàrdia-Olmos, J. & Juncos-Rabadán, O. The concept of cognitive reserve refers to an active process by which the brain compensates a situation of impairment by using cognitive resources. However, this concept cannot be directly measured and tends to be operationalized as a set of latent variables. In order to identify these latent variables, the authors of this paper build on a structural equation model that analyses the effect of cognitive reserve on three cognitive areas: episodic memory, working memory, and general cognitive performance. This study makes two important contributions. First, by adding a large number of indicators related to the cognitive reserve concept, it provides a more complex picture of this concept and it helps to diminish the risk of overlooking any activity that could contribute to significantly improve the cognitive reserve. Second, the results from this study show that the concept of cognitive reserve seems to be explained by two factors: educational level and lifestyle. Feliciano Villar is Head Professor of Psychology at the Developmental and Educational Department (University of Barcelona). Professor Villar presents one of his latest studies that aims at exploring how people working in long-term institutions for older people interpret and react towards sexual behaviour displayed by residents with dementia. SIforAGE’s main goal with an active and healthy aging in mind is to promote stakeholders’ cooperation in order to, among others, develop social capital. However, it is still a challenge to find efficient evaluation methods of intergenerational cooperation programmes. 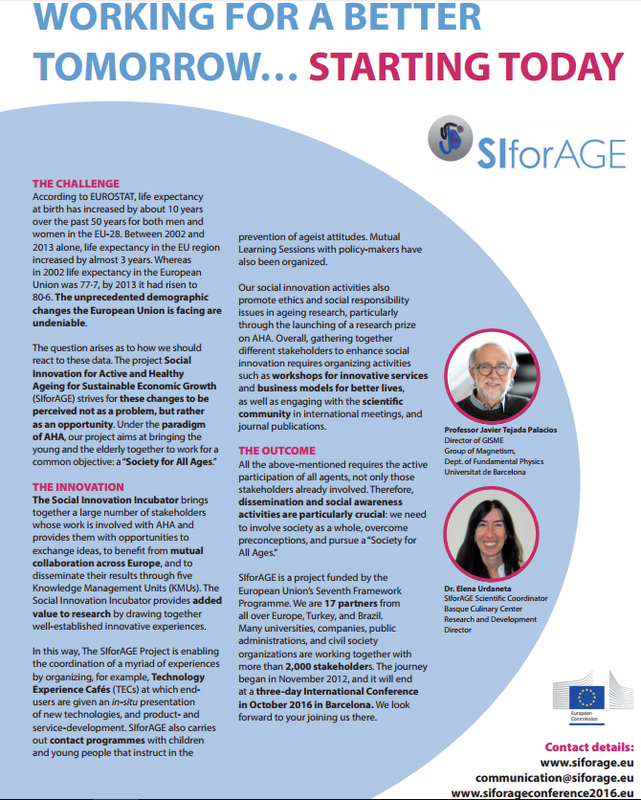 Elza Maria de Souza, who is a member of the SIforAGE’s team responsible for promoting social engagement in research, has led one of the few evaluation projects aimed at promoting social capital and the first one consisting of an intergenerational intervention. The main hypothesis drawn was that guided intergenerational activities based on reminiscence of the past as means of social contact would promote a change in adolescents’ beliefs and attitudes, which could result in a better understanding between generations and an improvement of the cognitive components of social capital. The setting was Celiândia (DF-Brazil), a country with high inequality rates, and the method used was triangulation (randomized controlled trial, focus group technique and process observation), which was founded on the Social Learning, Dialogical and Reflective Theory (SDRT). The program involved 253 students and 266 elders and relied on a questionnaire administered before and after the main 4-month intervention. It involved a series of small-group interaction activities, according to which the age groups were divided into control and experimental ones. The activities consisted of talks on common topics (school-days, migration or marriage), using objects as memory triggers, and workshops in which the students and the elders together made cartoons, little books and old toys, which were exhibited at the end of the project. In addition, some celebrations took place at the same time that some participants’ birthday and some relevant dates like the Elders’ and Adolescents’ National Day. The results were significantly positive in terms of a better understanding between generations. As for family relationships, all participants reported a change in the way they treated and felt treated by others. As for self-rated health status, the young gained awareness of their privileged situation. And, as for components of social capital, although no variation in trust was noticed, norms of reciprocity were strengthened: stereotypes were abandoned, the young were more aware of age discrimination and the elder developed confidence. In general, all participants reported a sense of freedom and of being valued by others, described the project as a chance to bridge the gap between generations and the young told they would recommend the experience. On the whole, although the study had some limitations in organization and participation and further research is needed, qualitative evaluation methodology proved to be essential for this kind of interventions and intergenerational interaction programs proved to be a means for promoting health of both old and young as well as to be useful for service providers and policy makers, as it was made clear that both age groups are an important human capital, not fully explored yet, that can help to build up a more cohesive and healthier society. The description of a triangulation in Brazil. Ciência & Saúde Coletiva, 15(5), 2521-2532. De Souza, E.M., & Grundy, E. (2007). Intergenerational interaction, social capital and health: Results from a randomized controlled trial in Brazil. Social science & medicine, 65 (7), p. 1397-1409. De Souza, E.M. (2011). Intergenerational interaction, social capital and health: a theoretical framework and results from a qualitative study. Ciência & Saúde Coletiva, 16(3), 1733-1744.